There's a lot in the news recently about the nuclear program in Iran. The neocons that talked us into an unnecessary war in Iraq appear to be using similar strategies to raise the level of tension with Iran. Already, it is quite likely that Israel has been at work in assassinating several of Iran's nuclear scientists and causing an explosion at one facility. One never knows for sure these days what hands might be involved in these operations, under the cover of "national security" considerations. The national security state is not very friendly with media attention and public transparency. I wonder why? Could it be that the public might find some activities morally reprehensible? 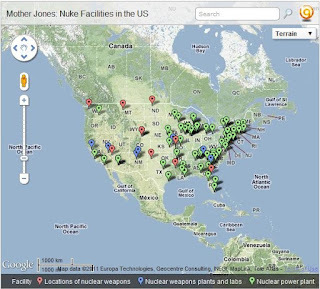 As the nuclear program in Iran hogs the headlines day after day, almost no-one is taking notice of our own nuclear program in the U.S.. There's no doubt about our intentions. When we lofted the Minuteman III intercontinental ballistic missile from Vandenberg Air Force Base in California on February 25, it wasn't for domestic energy consumption. It wasn't even for defensive purposes. It was a test of a first strike nuclear weapon that continues to place the world on a hair trigger alert for nuclear armageddon. Currently, in Wyoming, Montana and North Dakota, there are 450 of these nuclear armed missiles ready to fire at a moments notice. Unfortunately, there are as many in Russia, armed and ready to fire as well. The problem with this situation is, you have to make sure your missiles get off the ground first, otherwise they could be caught in their silos by a surprise attack from the other. It only took that Minuteman III fired from Vandenberg thirty minutes to reach the Marshall Islands. When you figure in nuclear armed submarines on both sides, a nuclear armed missile from off the West coast could reach Montana or Wyoming in less than twenty minutes. So the Air Force personnel in those nuclear silos have a small window of opportunity to make a decision about the future of the planet. Is the blip on the radar screen a technical failure, a flight of geese, or an incoming missile? Even a limited exchange of nuclear weapons could mean utter catastrophe. If less than 1% of the world's nuclear weapons were used in a nuclear exchange it would lead to nuclear famine. The smoke from burning cities would shut out warming sunlight for up to ten years, making it impossible to grow food and causing massive starvation. That's not to mention the poisoning of the planet from radiation. I'm reminded of a visit with my nephew years ago, when I was interviewing for a campus ministry position at South Dakota State University. A student at SDSU, he and I got together over dinner. He told me that evening how he had always expected to die in a nuclear exchange. He had that expectation for as long as he could remember, since he was a child. No-one should have to live with that very real expectation. What a terrible legacy my generation was leaving our children and grandchildren. It was a defining moment for me. It led me to some experiences at Ellsworth Air Force Base, where, between the bombers and Minuteman missiles, we maintained the largest nuclear weapons complex in the country. We got rid of the South Dakota missiles. There was a mutual drawdown with the Soviets. Why can't the de-escalation continue, the first strike weapons be dismantled? I'm reminded of all this because, fortunately, I subscribe to some alternative news sources. They keep one abreast of what's really happening in the country, not just what the 1% want you to think is happening. Daniel Ellsberg, of Pentagon Papers fame, was arrested on February 25th. with several others, protesting the test firing of this first strike missile. Ellsberg, you may remember, was a consultant, to the Department of Defense and White House specializing in command and control of nuclear weapons, nuclear war plans and crisis decision making. All of this while he was a defense strategic analyst for the RAND corporation. One has to be concerned that someone of his background would go to Vandenberg in the middle of the night to protest a test flight and be arrested. 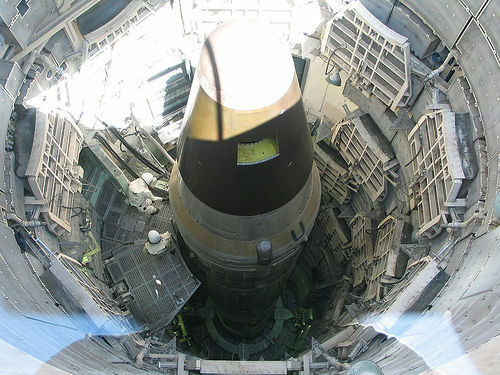 Ellsberg said, "So the existence of these weapons, in this country, compels virtually both sides to be on a High Alert status, prepared to go off on what might be a false alarm … The risks of having nuclear accidents are outrageous, and it is inexcusable that these weapons continue to exist." So why do they continue to exist? Why aren't we working for a nuclear free zone in the middle east? Why aren't we continuing negotiations with the Russians to reduce nuclear stockpiles? Why aren't we modeling the kind of behavior that might influence India and Pakistan to reduce their nuclear weapons? Must we have an accident or an intentional detonation before we understand it's not in the interests of the human community to continue testing and threatening and developing these weapons? Once again, there are some who have an enormous investment and stake in the continuation of nuclear weapons and their assorted technologies. Only when the public, the commons, reclaims its voice, its hands and feet, will change come. I'm grateful to Ellsberg and the others for pricking my consciousness again. I believe it continues to be the most significant moral issue of our time, a policy that has no rational, let alone moral, foundation. MAD (mutual assured destruction) should be on the dustbin of history!